In twentieth-century Western society, “big” became synonymous with “powerful.” To connect with a wide audience, for example, a musician needed a contract with a big record company; an author needed the promotional help of a commercial publisher. But no longer, points out Nicco Mele, a Harvard Kennedy School (HKS) adjunct lecturer in public policy. In a new book, Mele explores how technological advances have combined with cultural and economic factors to tilt the balance of power in favor of the little guy, undermining and destabilizing big players who once seemed invincible. The new power of grassroots movements has its pluses, for sure. In the case of entertainment, the rise of the Internet has made it easier for the public to discover new music without the big recording companies. In politics, the Internet enables candidates to raise funds and publicize their platforms without backing from a major party. The local-food movement and proliferation of farmers’ markets give consumers an alternative to big agriculture and food conglomerates. 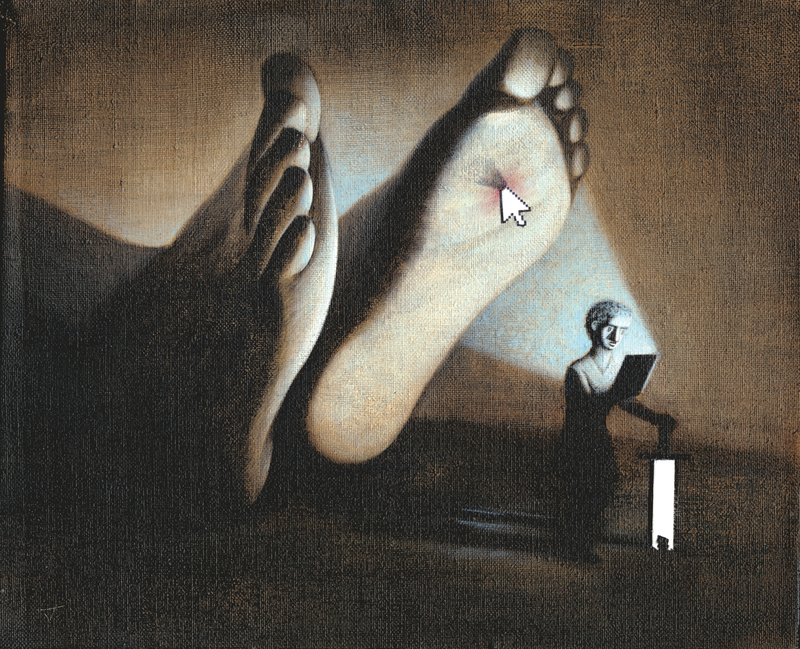 But Mele makes clear that there are downsides as well in his new book, The End of Big: How the Internet Makes David the New Goliath (St. Martin’s Press), intended as a wide-ranging wake-up call. He points out, for example, that the Internet gives writers a platform to reach millions of readers, but asks who will produce reliable journalism if all the big newspapers die. In politics, the Internet can fast-track a little-known candidate to fame, but that could lead to the election of demagogues. And in the commercial sphere, as small-scale manufacturing becomes increasingly viable, who will guarantee the safety of products such as aircraft and pharmaceuticals? Mele (pronounced me-lee), who led Web efforts for Howard Dean’s 2004 presidential bid and now consults on Internet strategy, teaches courses at HKS on digital strategy for political campaigns and on media, politics, and power in the digital age. He also serves on the advisory board of Harvard’s Nieman Foundation for Journalism. Although opportunities now abound for authors to self-publish, reflecting precisely the trend his book describes, he purposely chose a major publisher because he aims to reach leaders ensconced in large institutions who complacently assume those institutions aren’t going away. He reserves his harshest criticism, and sternest warnings, for government officials who fail to recognize the threat that new technologies and grassroots forces pose. For example, he writes about one community near Atlanta that, dissatisfied with the local government’s lack of responsiveness, privatized all of its public services, effectively replacing city hall. This might appear an efficient way to maneuver around red tape to get results, but if enough communities do this, Mele warns, government will lose its authority altogether. It is time, he writes, to stop assuming that technology is solely a force for good. Instead, he declares, it “empowers both sides of the equation—pro-democracy human-rights activists and loose networks of terrorists.” But if citizens make a concerted effort to reinvent institutions in line with the values they hold dear—rule of law, due process, free markets, the protection of civil liberties—the present holds tremendous potential. Mele sees this moment in history as an opportunity to reimagine our institutions so they can harness the best of technology and pick up where technology leaves off. He identifies some promising efforts, including those of the Pirate Party, active in several European countries: its primary concerns include protecting individual privacy and using technology to facilitate direct democracy. He notes that Iceland rewrote its constitution using a process in which citizens participated via social media, and that, along similar lines, Furman professor of law Lawrence Lessig has joined forces with the Tea Party in calling for ordinary citizens to organize a constitutional convention.